Slogging over mountains in China. This stage looks like an incredible slog Sarah – despite its beauty the environment looks challenging and spirit-breaking from where I’m sitting. You’re doing an amazing job – I don’t know how your body can perform every single day but it must be your strong mind that gets you back on the bike each morning. Hope you’re keeping well (and warm) – we’re all willing you up that mountain! Ohhhhh m’lady that looked tough! Cheering you on all the way though and glad to see that smile still shining through. Another great achievement, you did so well getting up that mountain, where do you keep getting your energy from, Hope you still have plenty of Mars Bars, when can you get your supplies replenished. Take care and hope the journey continues to go well. Your climb today makes my forthcoming charity ride for Migraine action trust look like a mini ride. Keep going. What happened to Gao, I seem to have missed when he left you. You are amazingly strong, Sarah. I’m exhausted just watching you pedal up those mountains, dodging transport trucks. I love that you keep on smiling. Hi, Sarah. Congratulations for you passing the Chinese border succesfully!!! 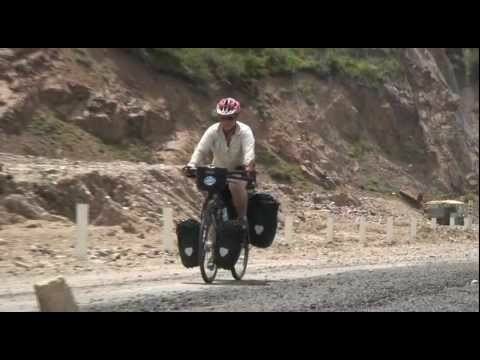 Which mountain were you peddling in this vidoe?